You are here: Home / MyPR / Support World Kidney Day at uShaka Marine World on March 30th by walking the walk. World Kidney Day takes place on Sunday, March 14th and is a global awareness campaign aimed at raising awareness of the importance of our kidneys. All across the globe, hundreds of healthy lifestyle events are due to take place to highlight this and why we need to live healthy lives to take care of them. Already, 850 MILLION PEOPLE WORLDWIDE are believed to suffer from various kidney diseases. Chronic kidney diseases (CKD) cause at least 2.4 million deaths per year and are now the sixth fastest growing cause of death globally. Moreover, CKD and AKI are important contributors to increased morbidity and mortality from other diseases and risk factors including cardiovascular disease, diabetes, hypertension, obesity as well as infections such as HIV, malaria, tuberculosis and hepatitis. Furthermore, CKD and AKI in children not only lead to substantial morbidity and mortality during childhood but also result in medical issues as our children grow into adulthood. 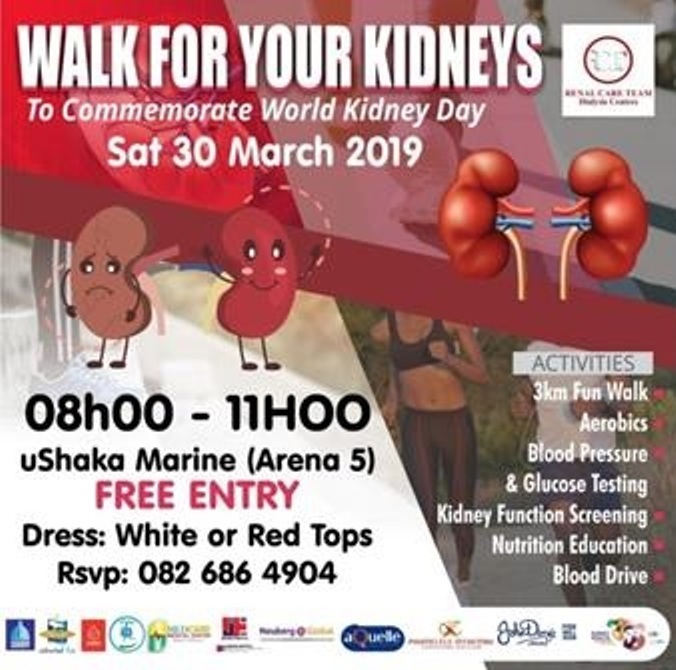 This year, uShaka Marine World’s contribution to raising awareness will be hosting this year’s special on Saturday March 30th in partnership with health event organisers Mabliza, the SA Kidney Association and Durdoc Hospital’s Renal department. The walk is only 3km and will start at Arena 5 and end at Arena 1 at uShaka Marine World. Entrance to the walk is free. Other activities that will be taking place on the day will be blood pressure & glucose testing, kidney function screenings, a blood drive and a nutrition educational. So, join the movement, support World Kidney Day and take care of your heath. For more information, contact uShaka Marine World on 0313288000.